I am not a soccer expert. I am not even a soccer amateur. I don’t know the game very well. But both of my children play soccer so that means that I go to a lot of soccer games. At each game I attend, I learn a little bit… if I’m paying attention and not talking to the other moms. When I try to give advice to my children, the response in various forms is basically that what I am asking them to do is harder than it looks. I tell them not to let the ball get past them if they are on defense. If they are on offense, I tell them to kick the ball into the goal–away from the goalie. I can’t give much more advice than that. 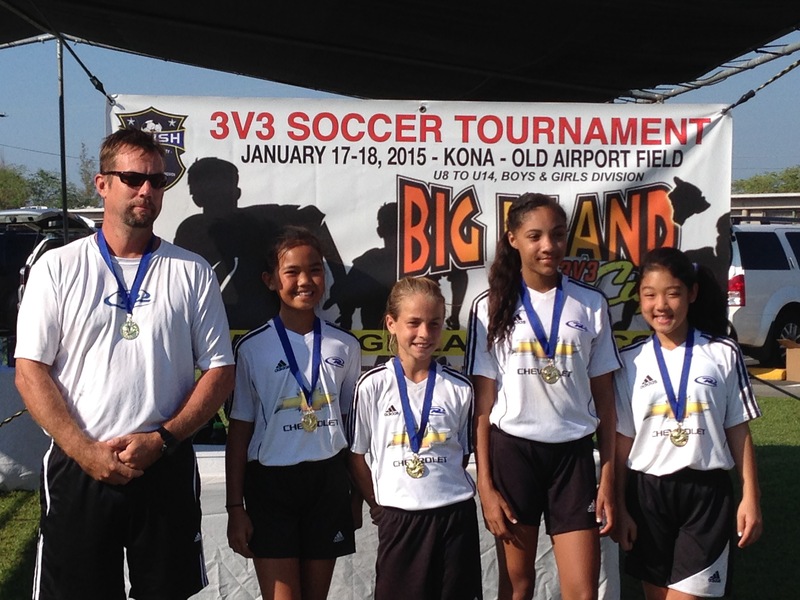 A team is more than just players–the coaches and parents are a huge part of the sport. For both my son and daughter’s teams, we have a great group of coaches and parents. We don’t just see each other at practices and games. We travel together to tournaments and hang out and have meals together. Team bonding is not just about the players bonding with each other but also about the coaches and parents bonding with each other. We find that we have so much in common with these wonderful people we meet just by the chance of our children being on the same team. How lucky are we that our lives have intersected? So, am I a soccer mom? If being a soccer mom means getting along with the other parents on the team, if being a soccer mom means encouraging our children to be involved in a positive activity, if being a soccer mom means giving up weekends and afternoons to chauffeur and cheer, then I might be a soccer mom. In Hilo, we have hula moms, tennis moms, swim moms, gymnastics mom, paddling mom, wrestling mom, judo mom, baseball moms, football moms, dance moms.. an endless list of the ways in which we support our children. All it means is that we are adults who support our kids and do what it takes to help them grow up to be productive members of our Hilo and global community. Living Hilo Style. *I identify with the female parental role since I am the mom, but the title dad, aunty, uncle, grandpa, grandma, etc. can be substituted in place of mom anywhere in this post.